Mr. Val Ojumah is a resourceful management executive with more than 30 years’ experience in Risk Management, Insurance Broking, Consultancy and Training within the Insurance Industry, Academics and Research. 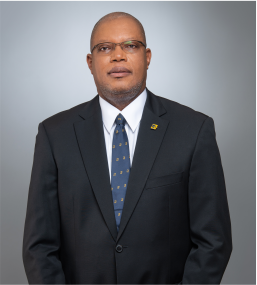 He has worked as a Lecturer at the University of Lagos as well as head of various departments within the broking firm of Insurance Brokers of Nigeria (IBN) Ltd.
As the First CEO of FBN Insurance Brokers Ltd, Mr. Ojumah demonstrated multi-disciplinary experience in all classes of insurance, risk management and loss adjusting. Mr. Ojumah has a First Degree in Insurance from the University of Lagos, an M.Sc. (Business) from University of Wisconsin-Madison and is an Associate Member of the Chartered Insurance Institutes both in Nigeria and UK.